I miss you, Steve. So you were preparing us for the big civil disobedience action by driving us over to Lockheed in San Jose — I shoulda known better with a resister like you/that I would love every action that you do/and I do, and I do, hey hey hey. Is it at all likely that if he gets busted again, the hardest working man in show business, James Brown, will be your cell-mate? “I feel good…” Yeah, but it isn’t that easy to feel good in jail, is it James, unless you have a schlemiel around to make the hours seem like eternity. You are a brave man. I don’t mean this action of civil disobedience, I mean going to the GTU library to read and research — what rough terrain for one such as you who so easily sees the shining idol of academics who’d rather read about evil than confront it— at Lockheed, at shopping mall, at our major Jesuit universities. I bet Max is pleasantly envious of your action. We will honor you — “blessed be his memory” — when we sup with Dan Berrigan and Jim Reale in a couple weeks at Apartment 11-L in NYC. Then Mev and I go to Block Island, and I plan on having a perfectly miserable time there. How can I enjoy myself there when you are baking away in jail, with the TV on 24 hours a day, the smoke, the blabbering (verisimilitude details, stolen from John Dear’s prison journal, Peace Behind Bars)? My beloved is slowly losing her gifted speech pizzazz. There are few things imaginably sadder than this — to be with the Mevster as she struggles to say what she knows she wants to say but can’t find the words. I know you share in this agony. I turned 35 this week and flatter myself by aspiring to be 1/10th of the mensch you are. I know you despise me, Steve, but it’s for this reason that I trust you and want to tell you about certain letters of transit that may be of interest to you. They cannot be rescinded, even by the Jesuit Provincial, something even our friend Bob Lassalle-Klein himself has never seen. Maybe one day you will be impressed with me. I love you and wish I could hang out with you. Maybe I’ll see you in October. Please let me know if you need anything (re: books). 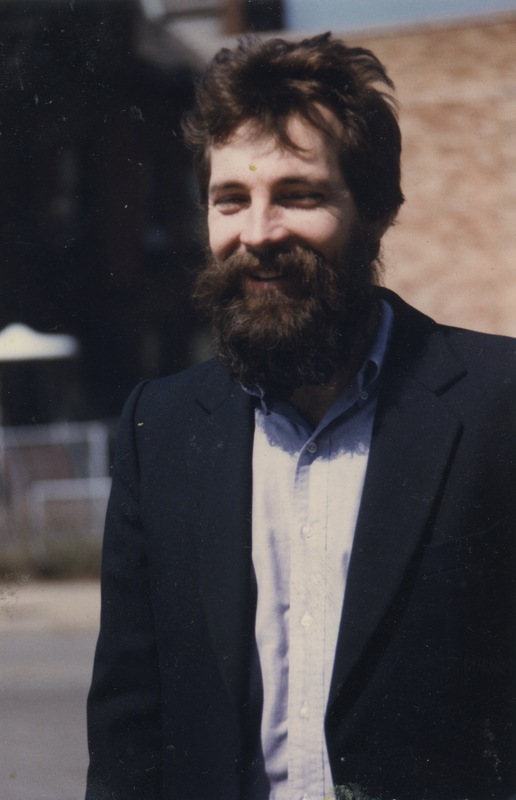 I showed John Kavanaugh the photo of you when you were a young Abraham Joshua Heschel-looking scholastic. He liked it. Photo above: Mev made Steve laugh, and took this photo. The institution of the dear love of comrades.